One of the most cherished symbols of the holiday season is and always has been the candy cane. They are usually one of the first things little children come to associate with the holidays and they stir a sense of nostalgia in adults bringing back cherished memories. From their bright and cheerful seasonal red and white twist of colors to the sweet smell and taste of peppermint, holidays just wouldn’t be the same without candy canes and it is what inspired these irresistible peppermint cupcakes. I’d by lying if I didn’t say I was a bit peppermint obsessed. I’ve clearly passed this trait onto my children, who can’t wait each year to buy our first box of candy canes as soon as they appear on the shelves (which is like June these days, but whatever, fa la la la). Also, while I’ve always loved to bake, we’re such a busy family that I rarely have time to share this passion of mine with my kids. However, the holidays are the exception, because we have a yearly tradition of setting aside a whole day to do nothing but bake yummy goodies. We must make about a 1/2 dozen different kinds of cookies and confections. I’m always looking for new recipes to try and sometimes when I can’t quite find what I’m looking for I whip up my own little creation. This year, it’s the year of the peppermint cupcake or as we affectionately call it our “Ode to the Candy Cane.” I hadn’t realized until recently that the candy cane actually has some very interesting folklore surrounding its origins. If you’d like to know more, you’ll find a brief history HERE. 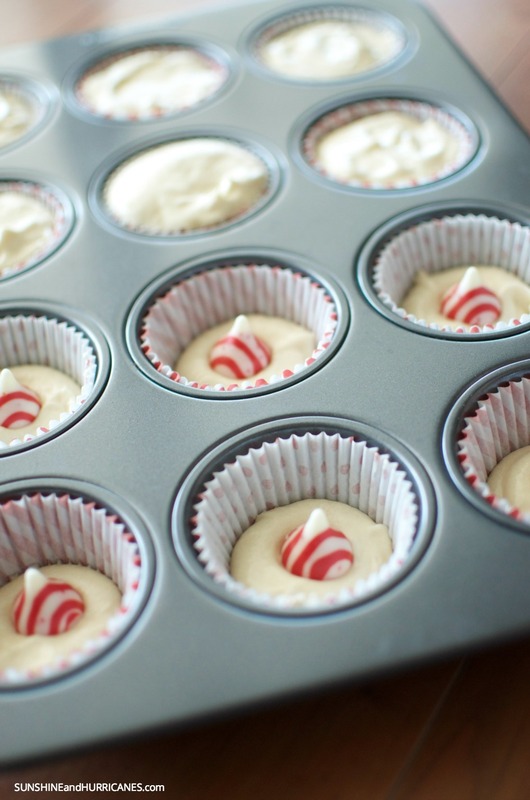 Okay, so now let’s get to the good stuff and whip ourselves up a batch of Peppermint Cupcakes. Here’s what you’ll need for the cake and the frosting as well as the toppings. You’ll notice that I used Bob’s Red Mill Unbleached Organic White Flour. It’s been a staple in my baking for quite some time as I just find it consistently creates some of the best textures for baked goods. This is actually the same high protein flour used by professional bakers and produces high, well-textured loaves of bread equally as well as light, airy baked goods. Preheat oven to 350º F. Line two cupcake trays with liners of your choice. I went with some super cute red and white liners that complimented our candy cane theme. Next, cream together the butter and coconut oil with an electric mixer until fluffy. 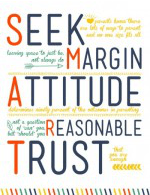 This should take you several minutes. You want to make sure you’ve got it whipped together well, because this really helps to keep your cake light. Now, add the sugar in a cup at a time and mix it in completely before you add the next cup. Follow the same pattern with your eggs, only adding the next one after the one before it has been fully mixed into the batter. In a separate bowl, combine the Bob’s Red Mill Organic Unbleached White flour, baking powder, and salt and whisk it together just until blended. Then in another bowl (or a big measuring cup with a pour spout would be even better) mix together the whole milk, buttermilk and vanilla and whisk it until blended. Alternate adding the butter mixture with the milk mixture making sure to blend well as you go helping to keep your batter light and fluffy. Okay, so now here’s the party where you can take these peppermint cupcakes up a notch. If you want, you can add a candy cane kiss to each cupcake. Again, totally up to you, but can add just a little extra fun and flavor. If you aren’t adding the candy, then just pour the batter into your waiting cupcake liners filling until about 3/4 of the way full. If you decide to walk on the wild side and add the candy, then you’ll fill each cupcake liner about 1/2 way, drop a candy cane kiss in the middle and then cover with remaining batter until the liner is about 3/4 full. Pop those peppermint cupcakes into the over and bake for 25-30 minutes, or until a toothpick inserted in the center comes out clean. Once they are down, you can let them cool in the cupcake pans or place them onto a wire rack. While they cool, it’s time to prepare your frosting. I used a basic buttercream recipe. Simply add the butter into a bowl and mix on medium high speed until fluffy. Next add in 3 cups of powdered sugar and blend on low until combined. Next add 1 Tablespoon of vanilla and 2-4 teaspoons of milk depending on how stiff you want the frosting. If you’re going to use a pastry bag and tip to frost, then go for a little bit more on the stiff side. Frosting can be a little tricky and isn’t always an exact science. 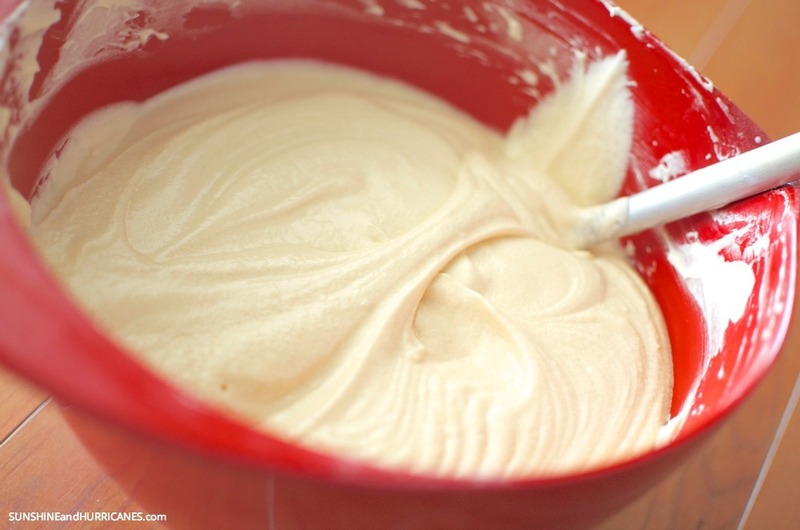 If you find that your frosting is a little too thick, then add a little extra milk (1 Tablespoon at a time). If it’s a little too runny, add an extra powdered sugar (1/2 cup at a time). Once the frosting is ready and the cupcakes have cooled, frost in whatever way suits you. You can be all fancy about it like I was or you can let your kiddos use a spatula and go to town. 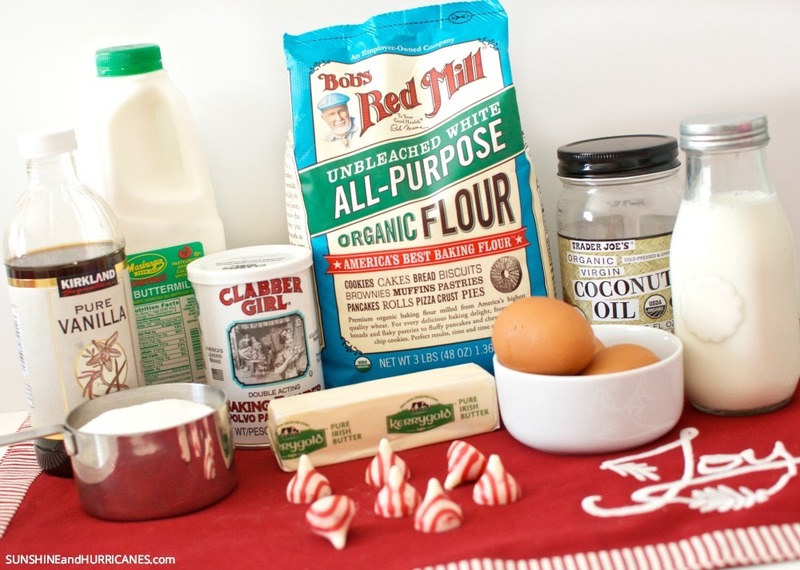 For the final candy cane flourish to make our peppermint cupcakes just perfect. sprinkle on some crushed up candy canes and a few silver sprinkles, because you know, everything at the holidays needs a little extra sparkle according to my daughter! Enjoy and we hope this will become a fun family tradition for you too. If you’re thinking of giving this tasty peppermint cupcake recipe a try or you have other holiday baking on your agenda, you can get a coupon for $1.00 off Bob’s Red Mill Flour, which includes the Organic Unbleached White Flour I used in this recipe as well as other varieties like Organic Whole Wheat Flour and Gluten Free 1-1 Baking Flour. Grab your coupon HERE and get baking! Preheat oven to 350º F and line two cupcake trays with liners of your choice. Cream together the butter and coconut oil with an electric mixer until fluffy. Add the sugar in a cup at a time and mix it in completely before you add the next cup. Follow the same pattern with your eggs, only adding the next one after the one before it has been fully mixed into the batter. In a separate bowl, combine the Bob's Red Mill flour, baking powder, and salt and whisk it together just until blended. Then in another bowl (or a big measuring cup with a pour spout) mix together the whole milk, buttermilk and vanilla and whisk it until blended. Alternate adding the butter mixture with the milk mixture making sure to blend well as you go helping to keep your batter light and fluffy. If you decide to add the candy cane kisses, then fill each cupcake liner about ½ way, drop a candy cane kiss in the middle and then cover with remaining batter until the liner is about ¾ full. Bake for 25-30 minutes, or until a toothpick inserted in the center comes out clean. Let cool. Add the butter into a bowl and mix on medium high speed until fluffy. Next add in 3 cups of powdered sugar and blend on low until combined. Pour in 1 Tablespoon of vanilla and 2-4 teaspoons of milk depending on how stiff you want the frosting. If you find that your frosting is a little too thick, then add a little extra milk (1 Tablespoon at a time). If it's a little too runny, add an extra powdered sugar (1/2 cup at a time). Once the frosting is ready and the cupcakes have cooled, frost and then add a final candy cane by sprinkling some crushed up candy canes and a few silver sprinkles on top. Follow Sunshine and Hurricanes ‘s board Christmas Food & Baking on Pinterest. 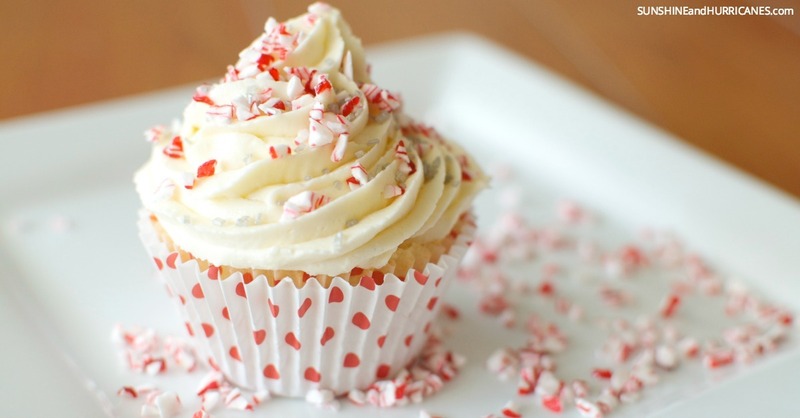 Would you eat your peppermint cupcakes with a big glass of milk or eggnog? These cupcakes are so cute I just had to make them tonight for a party. Can’t wait to see how they turn out!! Oh wow…these cupcakes sound very tasty. I love a good tasting and…good-looking frosting. Sometimes it’s the frosting that catches my eye and draws me in to a cupcake. These look adorable!! It’s like a hidden little surprise inside!! I haven’t had a peppermint cupcake before, but these look delicious! I will definitely have to try them! These look adorable and delicious! I am definitely going to have to try them! I was looking for a fun dessert to have for Christmas. These would be a great idea. Bring on the peppermint! These cupcakes look delicious! I would definitely have mine with some eggnog! The peppermint cupcake looks so rich and yummy. My family will love this. My mother loves the taste of Peppermint. These would be perfect to surprise her with. Love all the festive colors and wow do those cupcakes look super delicious. Where’s the egg nog? they look beautiful and oh so delicious!!! I LOVE peppermint cupcakes. It doesn’t feel like Christmas until I eat a delicious peppermint cupcake! Those cupcakes really do sound delicious! Peppermint has been giving me problems this year though :/ Still, might make a batch for my s/o’s boys. I love peppermint! And I especially like the hidden peppermint kiss that you place inside each cupcake. Fun! Those sound so yummy! 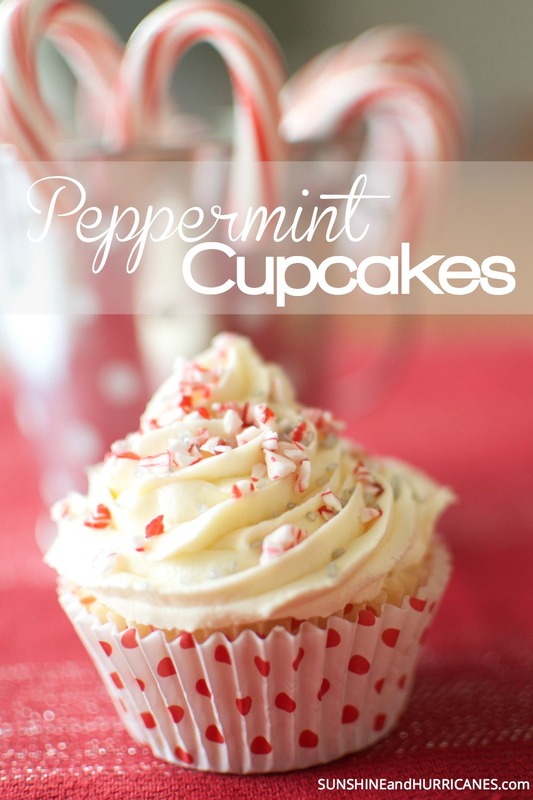 I love anything peppermint, so I am going to have to try out your recipe and soon! Those cupcakes look delicious. I’d have mine with a big glass of milk for sure.